In view of the enormous variation in colours, forms and sizes, you can really make your pond full of atmosphere with marsh plants. 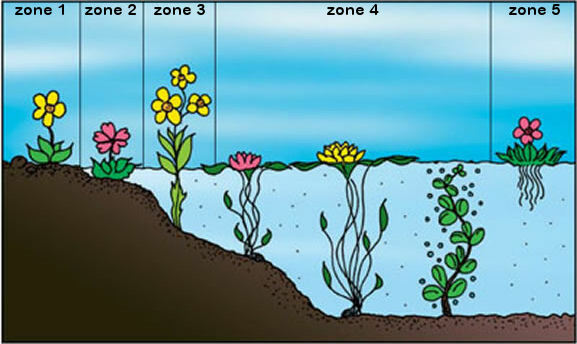 The biological function of the plants for pond environment is determined especially by their growth potential. The more nutrients, the better they will be able to grow and the more oxygen they provide in the water. Also the plants are therefore of great value for a natural equilibrium. What marsh plants do you choose? Marsh plants do not form such a homogeneous group of plants as water lilies. We count species among them which can stand 30 to 40 cm in the water (e.g. pontederia), species which have to stand swampy, however, not with its feet in het water (e.g. yellow marsh-marigold) and species which can grow both in the water and dry ground (e.g. moneywort). On top of that the demands they make on the culture medium may differ considerably. The best-known marsh plants are the Japanese pipewort (Equisetum japonicum), snakeweed (Calla palustris), Black Taro or Aquatic Elephant Ear (Colocasia rubra Black Magic) and Pickerel weed (Pontederia cordata). 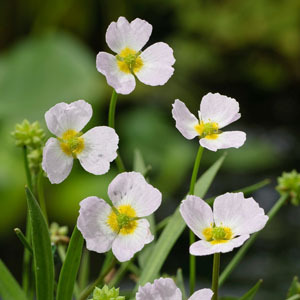 In newly sunk ponds all kinds of marsh plants can be put at once. The nutritive substrate in which you put them, should be as porous as possible. Water that is rich in nutrients and rich in oxygen can reach the roots better in this manner. Thus good growth is realised. Use nutrient soil or growth substrate for exuberant growth and blooming of roots and plant. Cover the soil with gravel to prevent rinsing out. Add, if necessary, additional iron and trace elements. A convenient tool to put in the plants are overgrowing mats. In this way you create a naturally grown intermediate area between pond and water side. If necessary, you can also put them in special floating islands for on the pond surface. For local fertilization of marsh plants special fertilization balls have been developed. Embellish your pond with marsh plan ts! fertilization balls are to be had in garden centres and pet and pond specialist shops.